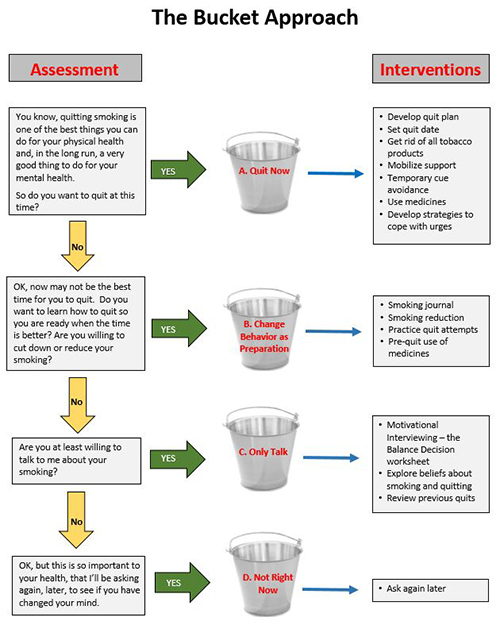 UW-CTRI Researcher Dr. Bruce Christiansen has been awarded a one-year grant from the Wisconsin Department of Health Services to create an online training based on his “Bucket Approach” to help patients with serious or significant mental illness to quit smoking. Christiansen will collaborate with UW-CTRI Communications Director Chris Hollenback to create videos for the online training, which will offer Continuing Education Credits via the UW training site that already houses a training for behavioral health providers on how to help all behavioral health patients quit smoking. The focus for the new training will be on reaching out to Wisconsin Community Support Programs (CSP) and Comprehensive Community Services (CCS) Systems. CSPs work with patients with serious mental illness typically at discrete treatment sites. CCSs generally treat patients with less-serious but still significant mental illness using network models. Both types of programs are county-based. The Bucket Approach is designed to tailor the intervention to various motivational statuses of patients with serious mental illness. The smoking prevalence among those with a serious mental illness (approximately 40%) is much higher than in the general public (13.9%). A common myth held by behavioral health providers is that their patients can’t—or don’t want to—quit. What is true is that it can be more difficult for people with serious mental illness to quit, and that’s where the Bucket Approach can help. For more on helping people with mental illness to quit tobacco use, visit www.HelpUsQuit.org.